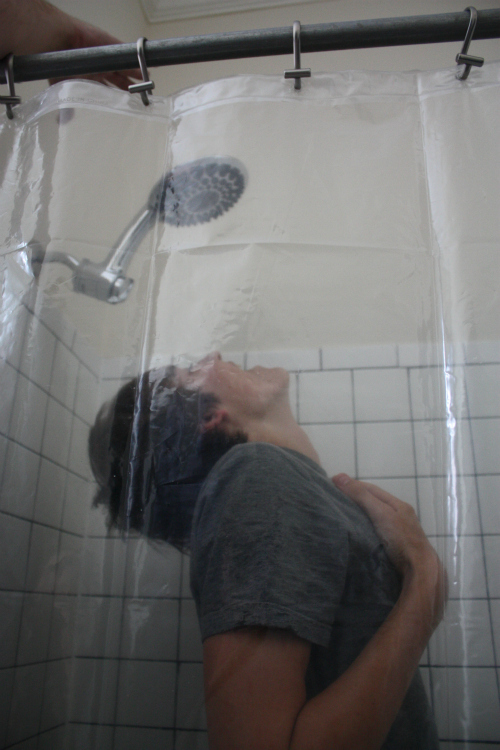 Sh Sh Sh — Shower! Slowly but surely we continue to make little changes around the house. 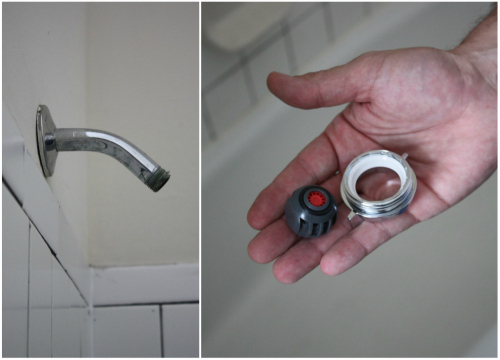 One of the more recent ones included switching out the old shower head in our guest bath for a newer version. 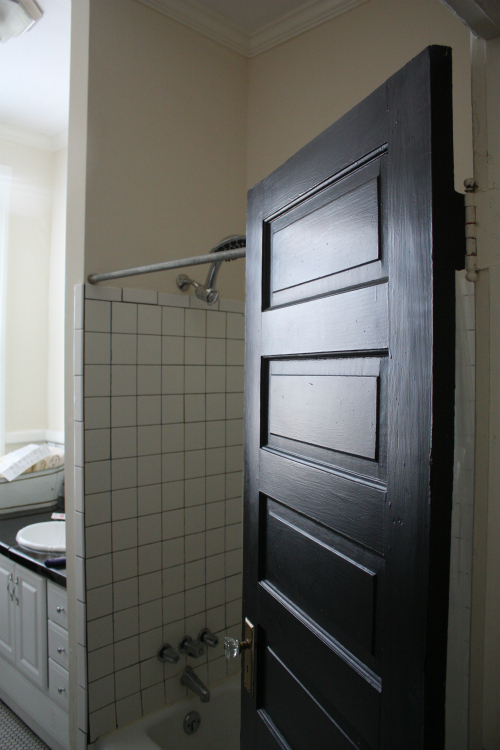 You can see the what we were working with in some of the original house shots. 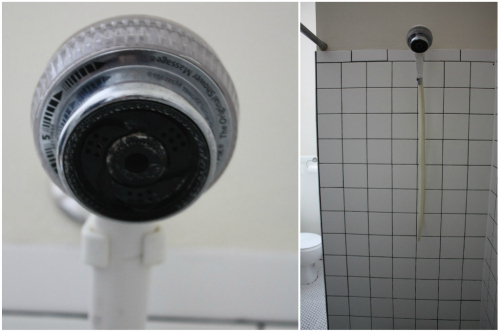 Here's a closer look at the original shower head in the guest bath. 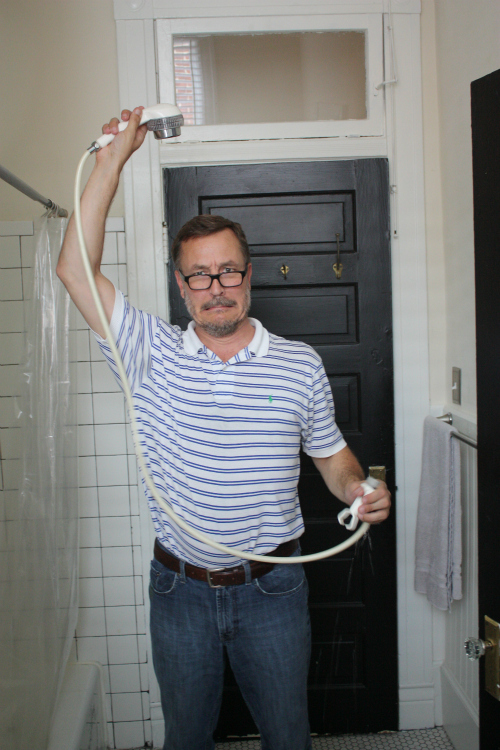 While it was certainly functional, both of Tim's kids told us the pressure was less than desirable and Brandon was actually too tall for this shower head to really have the full effect any shower should have. 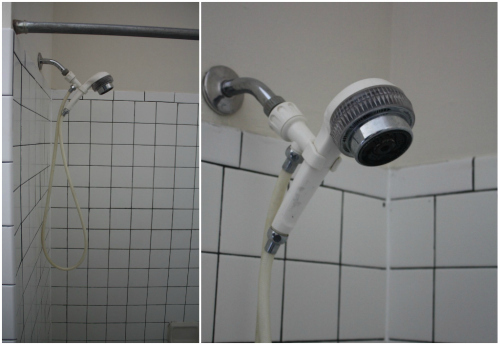 Aside from being functional, the shower head was a little outdated and looked like it had seen better days. 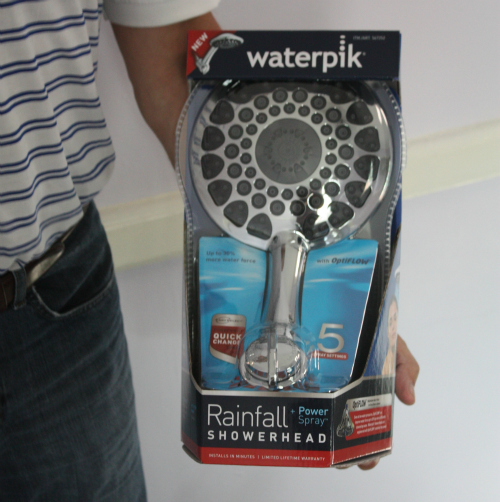 Knowing we'd want to switch this out at some point when moving in, we'd been on the hunt for a rainfall-style shower head and came across this waterpik version that had 5 speed settings and 3 height settings — could it be true? We figured we'd give it a whirl. 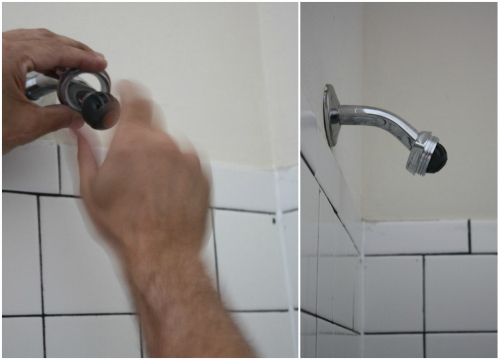 Removing the original shower head with a pair of adjustable pliers (feel free to wrap these in tape to avoid damaging the wall pipe). 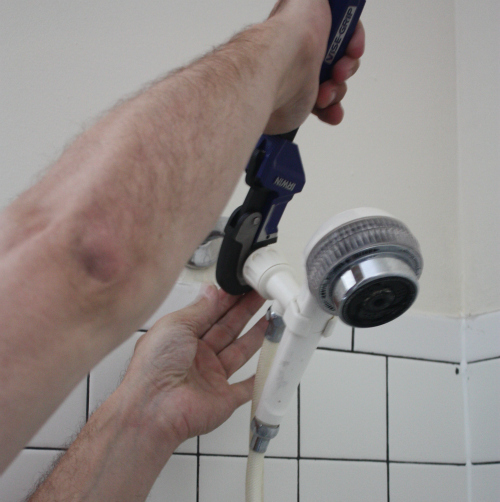 Cleaning up the wall pipe — removing any old sealant tape and limescale buildup that might be there — and wrapping a small amount of Teflon sealant tape 2-3 times around the threads of the wall pipe to prevent leakage. This is a good look for Tim, no? 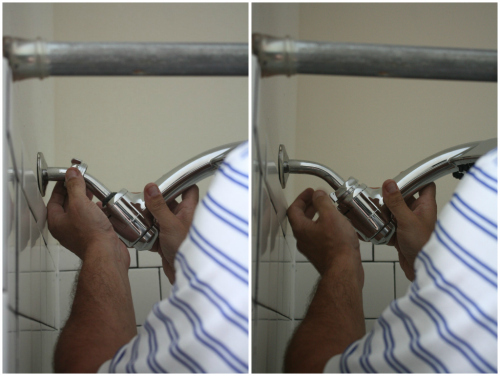 Gently installing the new shower head by hand first, then a final tightening with your adjustable pliers. 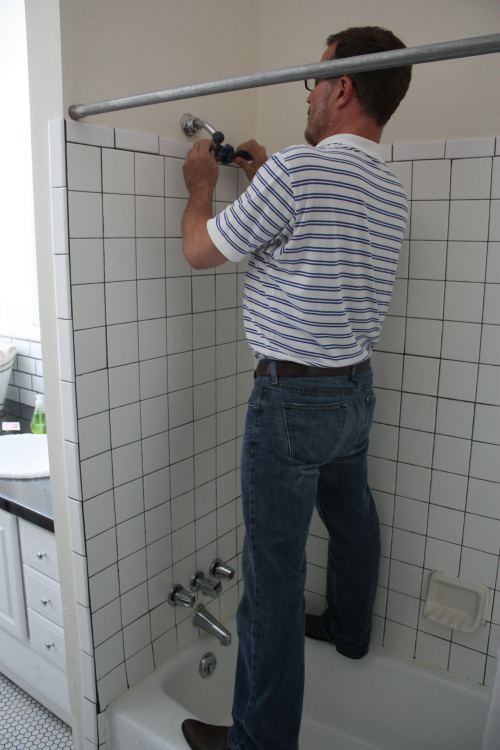 Once the new shower head is in place, test for any leakage from where the wall pipe meets the new head. What a huge difference in such little time! After the install and functionality test, we called in the true tester, Brandon, since he's half of the two folks who will actually be using it the most. 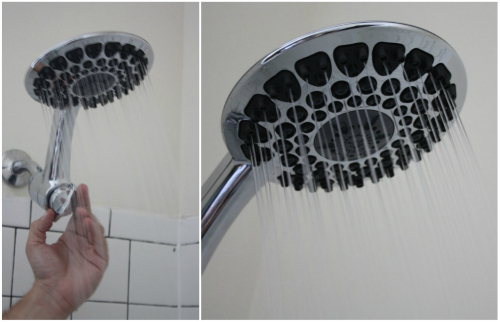 And look how tall the new shower head sits — allowing that rainfall effect even for this 6' 3" (and growing) giant we sometimes have living with us! 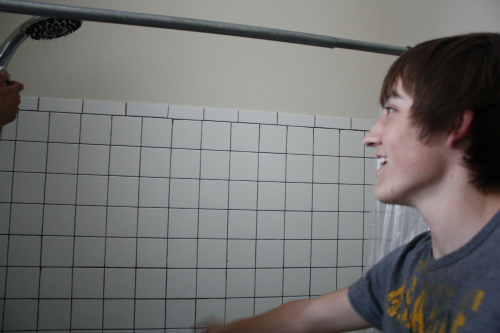 We set it on the tallest setting before telling him to come check it out and love how it can be adjusted back and forth depending what height any given person wants. We waited to post about the replacement until both kids had the chance to try it out. Stephanie was in town this weekend for her 20th birthday and neither Tim nor I said anything to her about it to see if she'd notice. 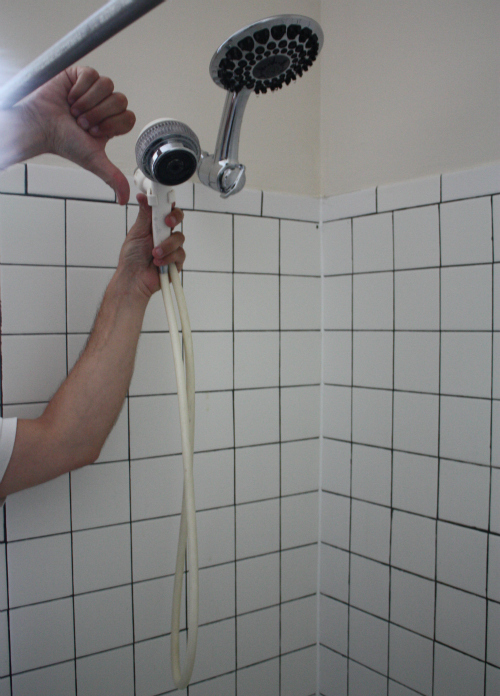 We considered test #2 the final success when she happily came down after a shower to tell us how much she loved the new shower head. Win! 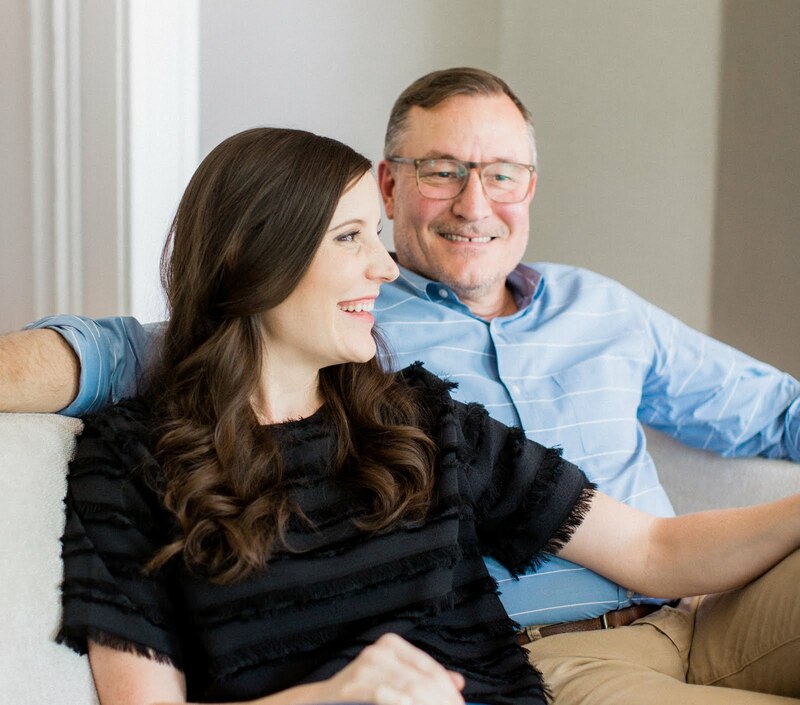 Now, we'll really be cracking when we get a fresh coat of paint on the walls, a real shower curtain and bath mat in there — one day at a time.